Today DermStore is opening of its first ever flagship store in Los Angeles, in Hermosa Beach. In addition to carrying the best of beauty brands, the DermStore flagship store is a sanctuary for west coast beauty lovers. The new store and salon is steps away from the Hermosa Pier in Hermosa Beach, CA. The upscale brick and mortar location of the popular online store is more than an average beauty supply store. The new store includes an expansive retail selection of quality products synonymous with DermStore.com, a luxurious hair salon and a spa featuring treatments from brands such as Decleor, Eminence, Phytomer, YonKa, Dermalogica, Guinot and Thibiant. The spa is small with two spa treatment rooms, but the services are terrific. I should know because I was treated to special pre-opening facial at the Hermosa store using organic Eminence products from Hungary. I was very pleased with the results, as I left with glowing skin that had been gently cleansed. Even the "extractions" were not painful, but gentle. Living in the South Bay area of Los Angeles, it's not always easy to find a good facialist or spa. Most of Los Angeles spas are in Beverly Hills or on the Westside. The addition of Dermastore to the South Bay area is a real plus. Now residents of Hermosa Beach, Redondo Beach, Manhattan Beach and other beach cities can have access to top-notch services and beauty products like Thibiant, that we've had to trek out of area for. Even better, visitors who go into the new store today will receive 10% off services and products in celebration of the grand opening. DermStore launched in 1999 with the vision of fulfilling the unmet need for a reputable dermatologist-backed online store, carrying only the finest cosmetic dermatology products. Since that time, it has evolved into the premier online destination for beauty and skin care products. The rapid expansion and evolution of the e-commerce site naturally led to the development of the new store. In addition to skincare, the new store will also feature hair care services and waxing services. 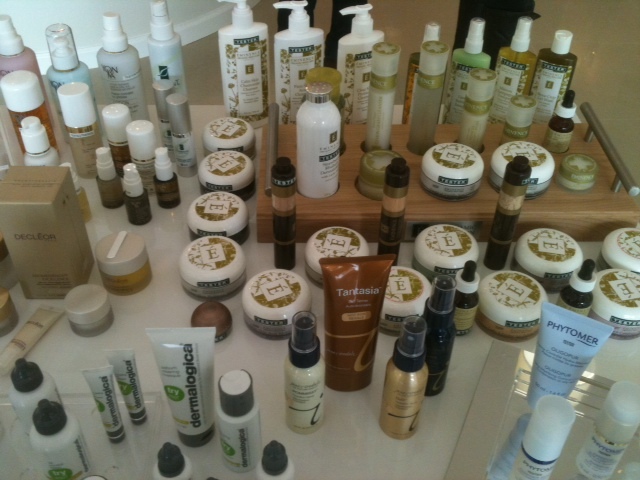 "I'm thrilled about the opening of the new DermStore retail store in LA," said Dan Obegi, DermStore CEO. "It gives us another opportunity to serve our clientele and gives us a space where we can meet our customers face to face every day. We'll use the DermStore retail store to test products before they hit the market, as a location for our photo and video shoots, and as another avenue for our customers to get the best products and the best service." DermStore is not merely a distributor of high-end skin care and cosmetic products, but stocks traditional retail beauty brands. DermStore only sells products purchased directly from the manufacturers and sells according to the brand's requirements so brands can sell - and consumers can purchase - with confidence. With more than 620 brands and over 23,000 products, DermStore has quickly become the leader in luxury skin care, beauty, and cosmetics online. Some of its most popular lines include Dermalogica, SkinMedica, SkinCeuticals, Obagi, jane iredale, Sonya Dakar, Philosophy, Glytone and Essie – however, the list expands as new luxury brands are added monthly. The DermStore flagship store is located at 1316 Hermosa Beach Ave, Hermosa Beach, CA 90254 and is open seven days a week, 10am-8pm.